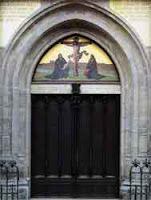 On October 31, 1517, Luther posted his 95 thesis on the door of the Castle Church in Wittenberg, Germany, unknowingly sparking the Protestant Reformation. His intent was to initiate a debate on the doctrine and practices of indulgences, but this event sparked a controversy that resulted in the excommunication of Luther and his followers in 1520 ... and the Lutheran tradition was born. This eased the later creation of the Reformed and Anabaptist traditions. Check out the Internet Christian Library (iclnet.org) to read all of Luther's 95 Theses.